Europe’s only dedicated magazine for design and production engineers working in the scientific imaging and machine vision markets. With its unique focus on European machine vision and imaging technologies, Imaging and Machine Vision Europe serves integrators, OEMs, suppliers and high-end users of machine vision, intelligent traffic, scientific imaging and vision-based security systems. The title’s independently-written content, coupled with insight and informed opinion from leading industry figures, provides an essential resource for those wishing to be at the cutting edge of vision technology. Through a combination of technology updates, best-practice case studies, event reports and in-depth feature articles, Imaging and Machine Vision Europe provides its ever-growing readership with the tools they need to develop and grow their vision business. Our close ties with industry bodies, such as the European Machine Vision Association (EMVA), the UK Industrial Vision Association (UKIVA) and the Verband Deutscher Maschinen- und Anlagenbau (VDMA), and global events, such as Vision (Messe Stuttgart) and The Vision Show (AIA), place us at the very heart of the industry we serve. For more than a decade, Imaging and Machine Vision Europe has been a sponsor of the prestigious Vision Award, which recognises outstanding innovation in applied machine vision. 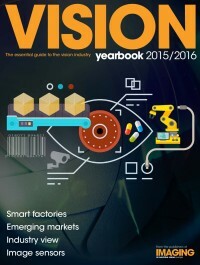 The Vision Yearbook is published annually (September), and provides a year-round resource for those in the vision industry. As well as detailed supplier listings, it contains informed comment and thought-leadership from leading industry figures. 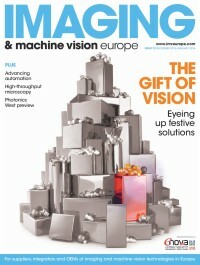 Imaging and Machine Vision Europe is published six times a year, and is available free to qualifying individuals in print or digital format. Marketing options include display advertising, outserts, and inserts, as well as enhancements to the digital version, such as video overlay. 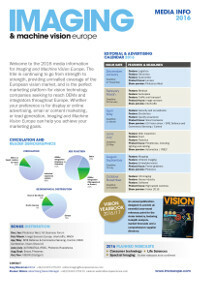 As well as showcasing all the magazine content, www.imveurope.com features pages of web-exclusive news, products, white papers, analysis and opinion, case studies, event previews and webcasts. Alongside traditional banner advertising, marketing options include white papers, sponsored content, and webcasts. There are two regular email newsletters: IMVENewsline, a monthly round-up of the latest news, event previews and more; and IMVEProductline, showcasing the latest in new technology. Marketing options include banner advertising, sponsored content, and product showcases.